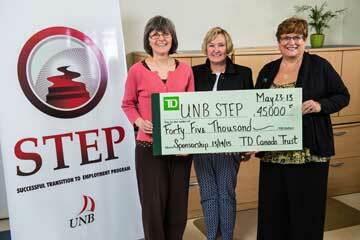 TD Canada Trust has donated $45,000 over three years to the Successful Transition to Employment Program (STEP) at the University of New Brunswick. The STEP program is part of the university's Student Accessibility Centre, which provides services and resources to students with disability-related needs. TD's donation will be used to fund the STEP peer mentorship program that was created to increase opportunities for individuals with barriers to employment. STEP mentors are typically graduate students, from a variety of backgrounds and disciplines, who provide support to incoming students in their transition to university life, or coaching and advising on career planning and skill development. To arrange a media interview, please contact Jody Gorham, director of the Student Accessibility Centre.